Well, my advice is: Don’t be disheartened if you get told this! Sometimes the estate agent doesn’t have anything within that budget range on their books. Sometimes the estate agent isn’t aware of what certain properties have been sold for in the recent past, because previous sales were taken care of by other estate agents. Perhaps he or she just relies on the vendor’s asking price. In this market (post Brexit referendum), an asking price is still just that – an asking price. Vendors and agents are beginning to catch up with the market adjustment, but may not have reduced their asking price yet. My estimate is that you can usually get approximately 10% off the asking price. 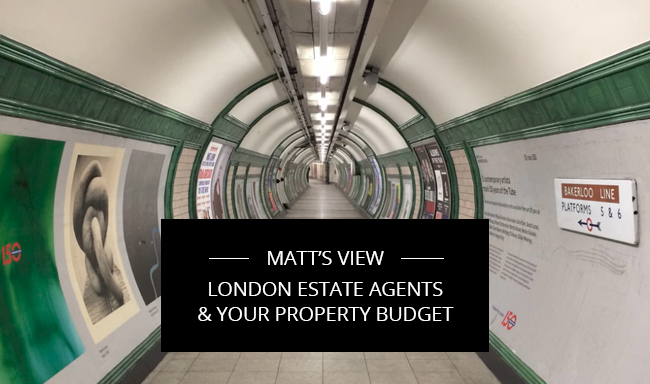 I had a client where initially, a property which I knew she would love was listed at a price that was above her budget, and she didn’t want to see it. But I explained to her we could probably negotiate – and in fact the higher price would mean less competition for the place. They did in the end reduce the asking price, and we got it for 9% less – which was well within her budget range. Remember, a property can be sold for less than that asking price. Don’t be worried about offending the owner or the agent – it’s all part of the game. What are they actually telling you? What the agent is actually telling you is that they personally are not marketing anything at that specific level. It really doesn’t mean that another agent 10 metres along the road will not have that exact thing. Be tenacious and keep looking. Register with every agent in person and keep going back reminding them of your search criteria. Do your research: You can actually visit landregistry.gov.uk and other similar sites and search for the particular property by postcode, in order to get the history of what that property has been sold for in the past. Get a second opinion. The good properties will probably not make it online and it could be you spoke to the wrong person in the agency – see point below. Speak to the hot agents: Try and ascertain who is valuing the properties in each agency, these are the hot agents which you need to speak with.